Polis’ lead was especially strong with Colorado’s unaffiliated voters, women and those who make less than $75,000 a year, found the poll, which was jointly conducted by one Democratic-leaning firm and one Republican-leaning firm. Stapleton beats Polis with male voters and those who make more than $75,000 a year. It’s important to note that this poll was conducted before last week’s widely-covered Senate Judiciary Committee hearings in which California professor Christine Blasey Ford confirmed her accusation of sexual assault against Supreme Court nominee Brett Kavanaugh. This poll was also completed before widespread media coverage of other Kavanaugh accusers, such as Boulder resident Deborah Ramirez. If you conducted this same poll today, chances are pretty good that the numbers would be considerably worse for Stapleton (and every other Republican on the ballot in November). 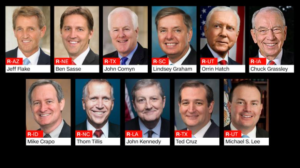 It’s raining men for Republicans on the Senate Judiciary Committee. Ford’s detailed allegations of sexual assault against Supreme Court nominee Brett Kavanaugh could allow Democrats to solidify an unprecedented advantage among those women, who represent one of the few steadily growing components of the white electorate. 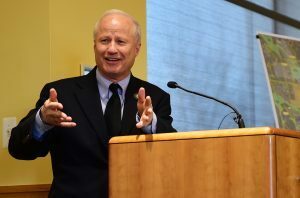 Rep. Mike Coffman (R-Aurora) pleads for support from female voters. “It’s less about his policies than it is about his tone. College educated independent women, just really are offended by his tone and his mannerisms in the office. [Pols emphasis] So it’s baked in now.” Coffman said, with resignation in his voice. You don’t talk about “college educated independent women” unless you’re seeing significant problems with this particular voter demographic. This is a big reason why Coffman can’t even produce an internal poll that doesn’t show him losing to Democrat Jason Crow next month. Of course, it’s easy for Republicans to blame President Trump for their poor image with female voters, but it’s not like GOP elected officials in Colorado and around the country have made much of an effort to do anything differently. Hell, it took Sen. Cory Gardner (R-Yuma) FOUR DAYS to publicly respond that he found Ford’s testimony to be credible — an admission he made on the same day that Senate Majority Leader Mitch McConnell declared that the Senate would vote on Kavanaugh’s confirmation this week no matter what happens with an FBI investigation into sexual assault charges. “Tone deaf” doesn’t do justice to this Republican idiocy. At this rate, we’re going to need come up with a new phrase entirely. Somehow I don't think those are the men the Weather Girls had in mind when they sang "It's Raining Men"….jus' sayin'…. It's interesting that you use Coffman's quote. Especially since I think he is trying to say that Trump's policies are not objectionable. I would like to hear Coffman explain child detention. "Though Coffman doesn't talk about it (his military service) as much, he, too, is a veteran." Today's lesson: Be cautious when reading national reporting about CD-6. Headlines like this are why no one cares what Colorado Pols thinks. Comments like this are why…no, too easy. Don't you get it? It's a dog pile! They'll be lining up now, and it's all a lie for publicity. The only people who believe this never wanted to give Brett Kavanaugh a chance anyway. are why nobody cares what you think. If one calls what you type thinking. So, turnout is key. Well known by Pols posters is the old saw that D voters skip mid terms and R voters turn out. 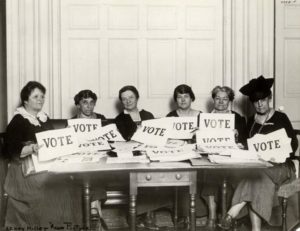 I do feel pretty good about likelihood that women will vote. I don't feel as good about male turnout. Economy, most agree is humming. So, I'm concerned that those earning below $75K and are convinced they got a tax cut will either stay home or vote for status quo. If you want to "party to excess," see if you can get an invite to Kavanaugh's massive keg party after he is confirmed. Party is still on if he isn’t confirmed; just wear black for the big drunken disaster drag. Is there a "ski party" on the DC Circuit Court of Appeals docket this week? I don't hate Republicans, and most women don't hate Republicans. This is not what the Quinnipiac poll shows. It shows that 55% of women (of all affiliations) don't want Brett Kavanaugh confirmed to the Supreme Court. I can't afford to hate Republicans. Too many are in my extended family, in my online circle of friends, in my work environment, in my community. I think they’re wrong, stubborn, willfully blind and intentionally deluded….. but I don’t hate them. If we decry the lack of civility and political discourse, we have to at least attempt to practice these. I think they’re wrong, stubborn, willfully blind and intentionally deluded….. but I don’t hate them. You better be careful. If you do not vilify, denounce and dehumanize all Republicans all the time, you will be accused of being open to being bipartisan by some. I've been called much worse .